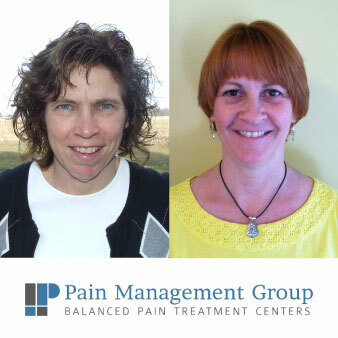 FINDLAY, OHIO– Pain Management Group (PMG) announced Anna Alexander and Susie Keegan as its new Clinical Operations Specialists. Ms. Alexander and Ms. Keegan will work as part of an implementation team in new pain management centers and oversee process improvement in existing centers. Their roles assure efficient start-up and high-quality day-to-day operations of PMG’s partner pain management centers. Anna Alexander received her Bachelor of Science in Dietetics from Bowling Green State University and an associate degree in nursing from Kentucky State University. Ms. Alexander has 23 years of experience as a registered nurse, the last seven of which were in a pain management center. Ms. Alexander and her husband Rob have three sons. She is an avid fan of her sons’ track and field activities, and enjoys exercise, reading and boating. Susie Keegan graduated from Owens Community College with an associate degree in surgical technology. She is a seasoned CST with six years of experience as a hospital CST and 16 years of experience with a fast-paced ophthalmology group as a CST and office assistant. She worked in a pain management center alongside PMG’s founder Dr. Ned Lakshmipathy for four years. Ms. Keegan and her husband Scott of 30 years live in Fremont, Ohio. They are blessed with two sons and a daughter-in-law—Jake, Tyler and Laurie. The appointment of Ms. Alexander and Ms. Keegan will improve daily operations of partner PMG clinics and contribute to the high-quality, balanced care of patients suffering from acute and chronic pain.